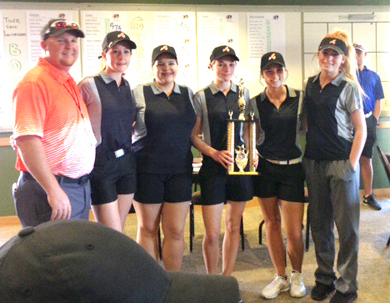 The golf course at Desert Hills in Alamogordo was an opponent in and of itself Monday, but the Artesia High School golf teams still managed some impressive results. The Lady Bulldogs picked up first-place hardware as well as a team and trio of individual state-tournament legs, and the Bulldogs were runners-up in an overall solid season-opening round. “The conditions played a huge part in that tournament,” Artesia head coach Dusty Bean said Saturday. “The weather was nice, but the condition of the golf course made that course very, very tough. The Lady ‘Dogs’ team 359 was 24 strokes better than second-place Deming Monday, with Brehnan Davis leading the charge with an 82. Josey Jackson posted an 86, Taysea Powell an 89, BriLe Ybarra a 102, and Morgan Atkins a 112. Davis, Jackson and Powell’s scores earned them individual legs. On the boys’ side, the ‘Dogs were two shots behind Ruidoso with a team 351. Jake Craft shot an 81 on the day, Wesley Davis and Giovanni Huitron 88, Parker Sanders 94, and Tanner Parker 95. “Josey was at least six shots if not seven shots off her average for the year, and Jake’s average is 72 and he shot an 81,” Bean said. “So that just goes to show you how tough that course was. The AHS golfers will compete in a trio of tournaments this week alone: Wednesday in Hobbs at the Rockwind Community Links, Thursday at NMMI in Roswell, and Friday at The Links at Sierra Blanca in Ruidoso. Overall, Bean says he’s been most impressed thus far with the competition not between Artesia and other high schools but between Artesia’s teams themselves. That level of intensity should serve the squads well as they continue into their regular season. “Our golf team is so competitive right now,” said Bean. “We’re taking five kids to every tournament, but there’s three or four more that we’re leaving home that could fill in anywhere. I’m excited about how competitive we are, both with the boys and the girls.